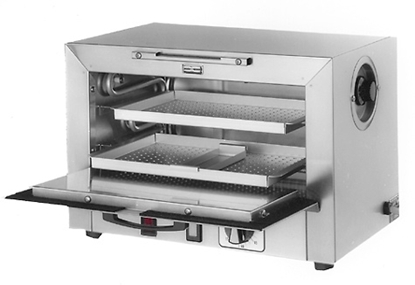 The Wayne Dry Heat Sterilizer is a fine precision instrument utilizing all the improved techniques developed in the more than 35 years experience in the designing, engineering and manufacturing of dry heat sterilizers. Only the best hospital grade material and scientifically proven components are used and rigid quality control during manufacture assures you of an instrument that will perform satisfactorily for many years. Both models operate at 320º-360ºF (160º-180ºC) automatically. Simply place unsterile items in trays, (plus small needle tray), and set timer. Plugs into 115V AC current. (Please inquire about other voltages). The Wayne Dry Heat Sterilizer is inexpensive to buy and inexpensive to operate. The S500 is a smaller model for the practitioner requiring less sterilization space. Has two Medium instrument trays . 50% capacity in usable space as the S1000.